A rather action packed week to say the least, which started last Thursday with the interview over the transatlantic telephone with Glenn Hughes. He was an absolute joy to talk to – his enthusiasm for the new Black Country line up was quite infectious and his memories of John Bonham sincere and touching. In between all that we had some good banter on the fact that his Wolves team had triumphed over Spurs the previous night. He was also somewhat surprised I was calling from Bedford, for it was the location he appeared here at in 2008 at the Jerry Bloom organized Deep Purple Convention. I missed out on that one but you can certainly count me in for checking out Black Country when they launch their album later in the year. 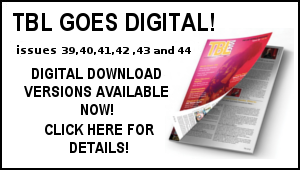 The full interview with Glenn will feature in the forthcoming TBL – yet another reason to subscribe. Equally joyous was the Friday night launch of Dec’s New Order book and the Saturday aftermath -and a bit of Monday night actually as this was one party we did want to end. 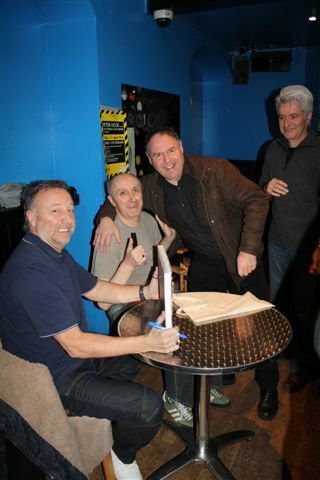 New Order’s Peter Hook was a gracious guest of honour signing my book enthusiastically ‘’Great days’’. It was amazing to see so many old friends who came from all corners of the globe to celebrate the launch and recall the way we were in the early 1980s. (Hello to Yvonne, Viv, Budge, Barry Wom, Alan J, Alan Stutz, Dave G, Quilla, Mick, Cath, Pat, Gaynor, Jerry, Lorri, Lorraine, Skid, Phil, Tom, Denise etc). Looking through the book I was reminded of the New Order gig I attended at Walthamstow Assembly Hall on Friday September 25th 1981. A crew of us from Bedford travelled down in a mini bus for what was a pretty riotous night. My good friend Alan and I were somewhat put off by the cold surroundings at the gig and decided to head to the next door pub. When the rest of the crew turned up about half an hour later we thought there must be an intermission. 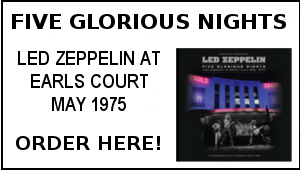 Alas the gig was over – as Dec writes in the book ‘’Those 40 minute sets can really throw Zep and Status Quo fans’’. 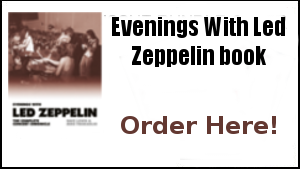 Looking at the date and my diary back then, I do know what swung my decision to go to the gig that Friday night – it was the fact it was one year to the day of Bonzo’s passing. This was a good way to get out and escape mulling on a sad anniversary. The diary also notes I lost my key that night and had to get my Dad up at 2am to let me in. Not best pleased!. Then it was up at 6.30am for a Saturday in the shop- hangover assured. Ahh the early 1980s –how did we do it! Having lived with the development of the book particularly in the last two months with Dec, it was pleasing to see such a magnificent end result. There was a little drama on the night as the books were only delivered at around 9 pm which was cutting it a little fine. Dec and I finally wrapped a journey that had began with an early morning beer on Friday December 4 and ended on Monday February 15 around 11pm as Dec finally headed back to London. To paraphrase the book title- From Pub to Pub: The evolution of a book at close quarters. Not that the connection will be quite broken – as I’ll now be a frequent visitor to the office where the New Order book was designed as that is where the next TBL will emerge from. Already had a few very fruitful meetings there and we are underway. Another journey commences. More on this as it unfolds. Another anniversary occurs on Saturday, a recent one at that. 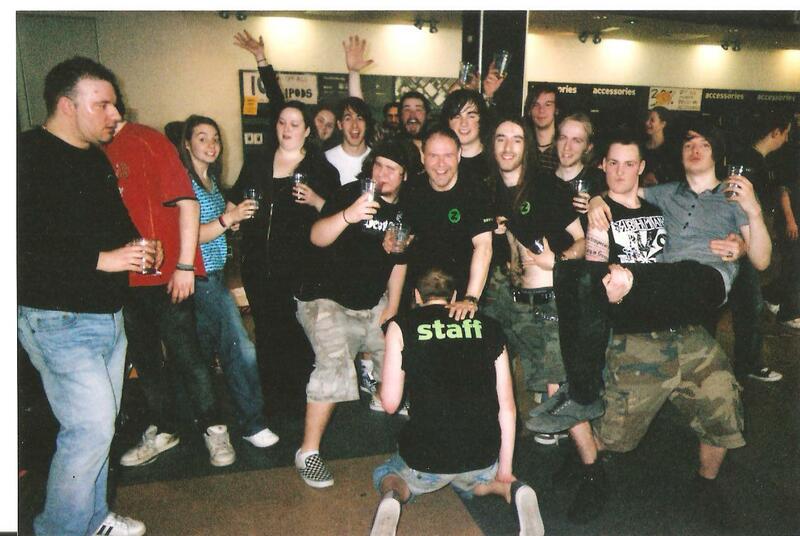 It will be one year to the day of the closure of Zavvi. It still feels like only yesterday that a sizeable reason for my being was centered around 9 Midsummer Place Milton Keynes. Great days particularly the last three years when I worked with an amazing bunch of inspirational people. Looking back over the year gone, it took many months for me to even begin to accept that it was over, but gradually there has been a closure of sorts and the acceptance to move on. In its place there is a vastly different self motivated objective and focus now, as I try to carve out a living in a freelance/ publishing status. There’s been some achievements so far and there’s certainly challenges ahead. If anything it’s the day to day banter I still miss, but the memories are all intact. You can take the man out of Zavvi, but you can’t take the Zavvi out of the man. To the colleagues featured in this photo below taken on the boisterous last day Feb 20 2009 (and it’s not what it seems honest! ), the message is clear. Guys thanks for the memories – never forgotten. 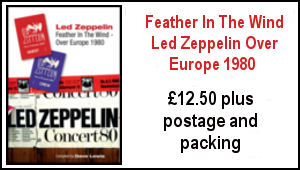 In between all the book launch stuff, there’s been work here on The Who Live at Leeds feature, some web site development consultation (apologies for the photo glitches we had as we updated the site in the past week) stuff on TBL 26 and the Over Europe book so plenty of plate spinning in progress. Nice to see the new Record Collector magazine which has a fine Jimmy Page interview and a four page extended interview with Eddie Kramer by yours truly. 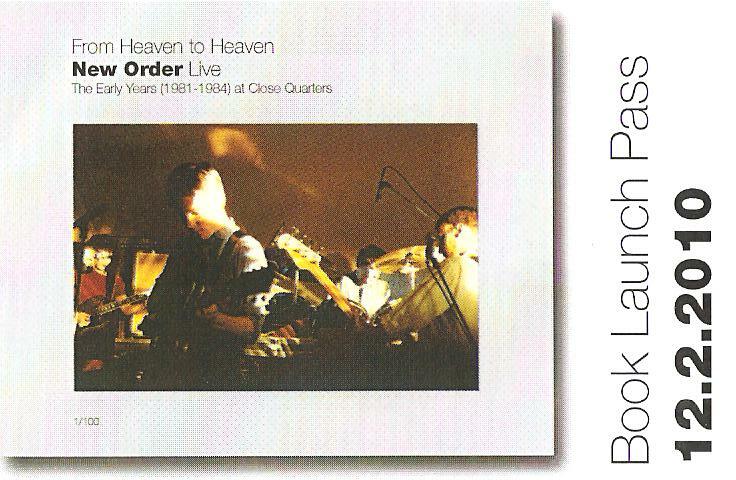 On the player, well a bit of New Order (Ceremony is one of my all time fave singles), loads of Who live including their Leeds and Woodstock sets, The Who Odds and Sods (a great collection of B sides & rarities) and Zep wise the Physical Graffiti outtakes in preparation for the 35th anniversary of that hallowed double album’s original release next week. Looking to the weekend, I’m down to referee Adam’s match on Sunday. Hope I don’t mistakenly pull out my New Order Book Launch Pass in place of a yellow or red card if required. That won’t indicate an early bath –just more beer! just to say how good it was to see you on Friday, you still rock !